If you're looking for the finest white water rafting NY has to offer, Fun New York is your definitive guide! 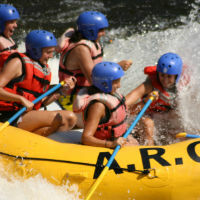 Read reviews and information about a series of great places to go white water rafting in New York. Wild Waters Outdoor Center is located in the beautiful Adirondacks, just outside of Lake George, NY. Wild Waters Outdoor Center's New York State licensed guides are informative, entertaining and, most importantly, concerned with your safety, you will have a guide with you the entire trip. Their 17-mile rafting trips take place on the Hudson River Gorge and offer a full day of excitement, breathtaking scenery and long-lasting memories. The Hudson River Gorge trips are class III - IV and recommended for ages 9 and up. The 3.5 mile Sacandaga River trip is perfect for first-time rafters and children 5 years and older. The Sacandaga River trips run 3 times daily, reserve your white water trip today! For true nature lovers, Wild Waters Outdoor Center offers an overnight rafting trip for groups of 6 or more. 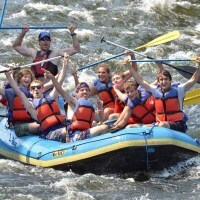 Visit the website for more information and to schedule your NY white water rafting trip today. Rated top 10 whitewater trip in the US! Adirondac Rafting Company invites you to enjoy one of the finest white water rafting adventures in the East. Their rafting season begins in early April and runs through mid-October (Columbus Day), and trips vary from family fun to raging big water, high adrenaline adventures. First time and experienced rafters are welcome! 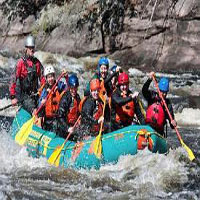 Adirondac Rafting Company's guides are some of the most skilled and experienced in New York, they will guide you throughout your trip to ensure your safety. White Water Rafting right outside of New York City, NY! Less than 100 miles from NYC enjoy miles of pristine Delaware River rafting, canoeing, kayaking & tubing! Our boat livery is the smallest on the Delaware River and for good reason. We give personal service, safe instruction and our employees are experienced in all aspects of boating on the Delaware. Joni Kulik, our office manager, has over 20 years’ experience in campground and boating. Fred Reber, owner, has lived and boated on the Delaware River for over 65 years! Our goal is to make your experience a time to remember and we hope you'll come back again and again! Your outdoor adventure is available by canoe, kayak, raft or tube. We also provide daily guided group “Evening Excursions" with a brief history tour. Eagles, deer and many other wildlife species are seen daily. Some river trips take you through the Scenic Delaware River as it was when the Lenni-Lenape Indians lived here. Our livery is adjacent to the landmark Carriage House Restaurant & Motel, which can offer food & drinks before or after your river trip. Come experience white water rafting in New York! White water rafting is a true love for adventurous people. It makes anyone forget about this boring world and have some crazy times. 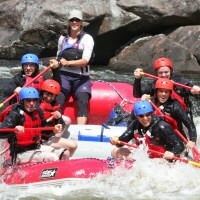 A great option for white water rafting in New York is Hudson River Rafting Company. It can be your true guide to white water rafting. 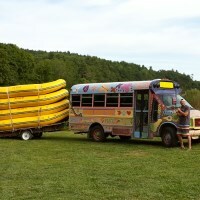 Hudson River Rafting Company is known for their great service. They are able to make your journey on the water a fun, exciting and safe one.